Ediror Note: Angelina Jolie is an actor, director, special envoy for the UN Refugee Agency and co-founder of the Preventing Sexual Violence Initiative. The opinions in this article are those of the author. 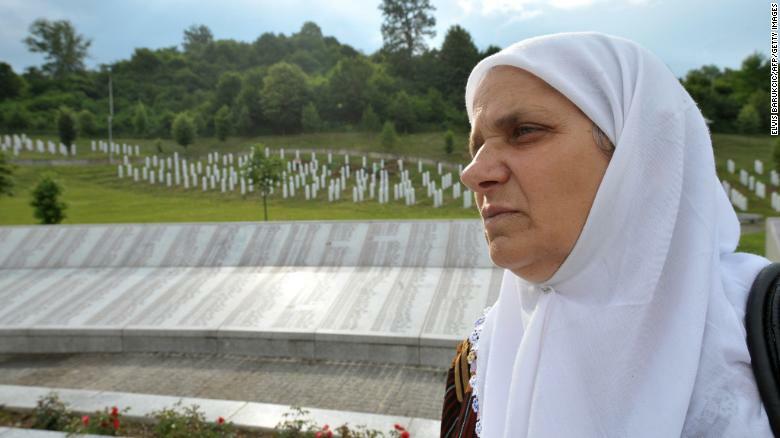 (CNN)News came today that Hatidža Mehmedović, who survived the war in Bosnia and led the Association of the Mothers of Srebrenica, had died in a hospital in Sarajevo. I met Hatidža four years ago when I visited the Srebrenica Memorial, where the victims of the genocide -- the worst massacre on European soil since the Holocaust -- are buried. I remember it vividly. Sitting in a circle of other bereaved and widowed mothers of Srebrenica, quietly and with the utmost dignity, she told her story. Hatidza Mehmedovic stands in the Potocari memorial cemetery near Srebrenica on June 30, 2010. Angelina Jolie visits the memorial center of Potocari near the eastern Bosnian town of Srebrenica in 2014. It is testimony to the depth of Bosnia's wounds that Hatidža did not live to see the end of the fight for justice and security for the survivors of Srebrenica. Others must take forward the burden she carried for so many years. But her example will live on, in the memories of all who knew her, and in the stories that we should all tell, wherever we live, so that the memory of Srebrenica never fades.